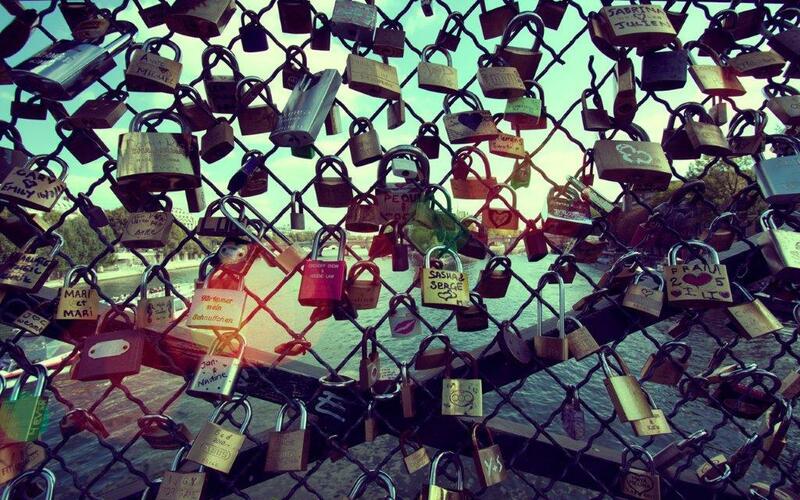 I’d love to return to Paris one day and walk the Pont des Arts – if only to breathe in the stories. Each piece of metal, many rusted and eroded through time, so singular in their tale, yet amalgamated in the one thing that brought them together. Even when it slips through the cracks – through insurmountable anguish of heartbreak and longing – the very memory of love is threaded in the fabric of our soul. No matter how many grains of sand seep through the hourglass of our tears, each of our relationships leaves an indelible mark. We are forever changed by each experience, no matter how far away we toss the key. Passing a random stranger in an elevator, you recognize their fragrance. Sitting in traffic – you suddenly hear a familiar song echoing in the distance. An old television commercial. Scenes from a movie. And if the loss of your love is fresh – every shadow with a similar hair color and body type (if you’re brave enough to face the world from under your covers) is a harrowing reminder of the vastness inside your once whole and happy heart. Inside every artist is a heart pumping their unique stories of love. From the depths of agony in the memory of what was lost, to the rebirth of joy cultivated in a new pairing – we feel. We create. Through music we compose, our words on the page, photographs we capture and paintings we bring to life, the padlocks of our love are everywhere. Each is to be respected. With love, there is no room for abuse, no tolerance in malice. When I was in my early twenties I lived with a man. I believed we were in love. Having escaped the treachery of family dysfunction, cloaked in deficits of self-worth, my vision of love was wrong. Enough time has passed to where I no longer think of Robert when hearing a familiar song or catching a sniff of his favorite cologne. But after watching the Ray Rice video of him abusing his wife (then fiance) Janay, my insides turned up a familiar terror. I don’t know her personally, but Janay Rice is just one of the millions of women all over the world who have been on the receiving end of violence in the face of love, myself included. Social media is a breeding ground for judgment, and having lived through my own story long ago outside the claws of modern communication, I won’t even begin to speculate how Janay is navigating through her feelings. If recent history teaches us anything about domestic abuse through the viral outbreak of Rice’s video – it’s that every one of us has an opinion which borders on judgment. With respect to Janay, her family and loved ones, I won’t pollute the interwebs with more of the same. I will, however, say what I know to be true from experience. LOVE is the antithesis of brutality – the arch-enemy of malice. And no matter how strong the padlock and how deeply buried the key with promises of unwavering strength, if your LOVE finds you on the end of your partner’s fist, it’s time to walk away. …love the last paragraph… the whole entry was excellent..! Love ya lots.!! I’ve walked the bridge – it is evocative. I love that! Great descriptor, too. 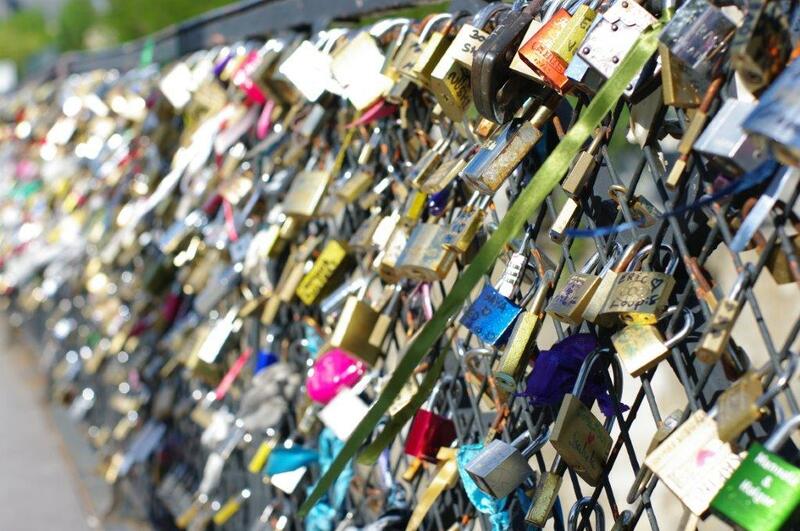 I learned that a portion of the Paris bridge actually collapsed due to the weight of all the padlocks through the years. Amazing. It doesn’t matter if its a winter or summers day, its wonderful to walk that bridge and see all those locks, they just make the day warmer and hope a little brighter. Thanks for sharing your thoughts on such a special place and the evil of “abuse in the name of love”. Very clever thoughtful article. A dear friend recommend your blog to me. This is a beautiful post. May I add abuse is not always physical, it can be psychology. I know this all to well. Agian your blog is wonderful and I plan to visit often.